Nutritious foods show up in abundance during November’s festivities. 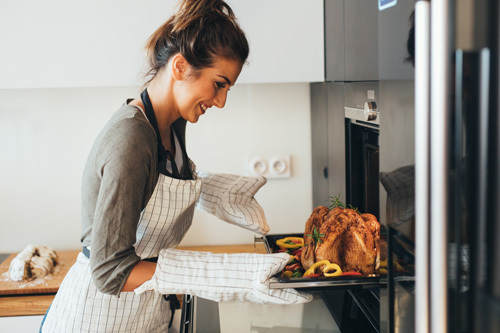 If you’re searching for nutrients that’ll help your smile, learn where they might be hiding in your Thanksgiving meal. Turkey is rich in protein, which means it contains high amounts of phosphorus.9 Phosphorus is important for strengthening bones and teeth as well as mineralizing them to protect against cavities.10 Just make sure to keep floss handy in case turkey gets stuck between your teeth. If you opt for ham, your mouth will still be happy. Eating just three ounces of ham provides 15 percent of your recommended daily zinc,11 helping replenish tissue along the gum line.12 Watch out for the sticky, sugary residue glazed ham can leave behind. If you do eat ham with a sugar glaze, brush your teeth or drink water afterward. The green beans in green bean casserole are a great source of vitamins A, C and K.13 Vitamins A and C are good for gum health,14 while vitamin K helps protect against substances that break down bones.15 Avoid cavities by ditching the starchy fried onions on top and choosing a recipe with toasted almonds instead. Yams contain vitamins A and C, too.14 Unfortunately, if they’re prepared in a sweet, sticky sauce, they leave cavity-causing sugars in your mouth. After enjoying candied yams, drink water to wash it away. There’s nothing like a freshly-made pumpkin pie, and you might be surprised to learn that this pie variety isn’t all bad for oral health. While pie typically has high amounts of sugar, the pumpkin in this one provides a healthy dose of vitamin A14 to help strengthen enamel and encourage gum health. Plus, pumpkin pie doesn’t require added sugars and can be made with spices because pumpkin already contains a naturally sweet flavor. Be careful about the crust, though, as it often contains starches that contribute to tooth decay. To keep your pumpkin pie mouth-friendly, make a nut crumble crust and replace white flour with nut flour.16 Or, for a sugar-free pumpkin pie alternative, try our pumpkin pudding recipe. Drink plenty of water throughout the meal to help wash away any residue that gets stuck on your teeth. And after a day of enjoying Thanksgiving food, be sure to clean your mouth thoroughly by flossing and brushing with fluoride toothpaste.